Have you ever thought about visiting Rome by bike, and enjoying Rome's streets, buildings and sunset at your leisure? Or onboard a colorfultuk tuk, for a completely original view on the city, which is totally in line with Hotel Abitart's philosophy? Rome never disappoints: whether you're passionate about ancient or contemporary art, or if you just like strolling through corner markets or wandering through glamorous galleries, we can advise you on the best itineraries and most surprising routes through the capital. The Flavio Amphitheater, the biggest every built in Italy, is the symbol of Rome and the whole of Italy. This is where games were held in ancient Rome. The people would gather to have fun and watch the famous duels between gladiators and animals. Today, its imposing ruins are still one of the most fascinating monuments in the entire capital. The archeological remains of the forums of Cesar, Augustus, Trajan, and Nerva are some of the best conserved ruins in Italy. 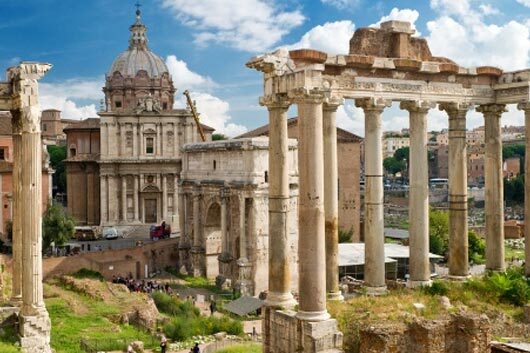 In Antiquity, the center of Imperial life and of the Roman republic, they still have an imposing air and a romantic charm. The Circus Maximus was the ancient Roman circus dedicated to horse races, but it was also used for exchanges and commercial purposes. Today, gatherings, concerts and national demonstrations still take place here. Nowhere else in Italy, and perhaps in the world, keeps as much precious artistic treasures within its walls as the Vatican Museums. The Sistine Chapel, Raffaello's frescoes, and the sculptures and paintings of Giotto, Beato Angelico and many other masters of Italian art definitely deserve a visit. Who can forget Audrey Hepburn and Gregory Peck in the film Roman Holiday, speeding through the beautiful Spanish Steps on a vintage Vespa, with the Trinità dei Monti staircase in the background? Stop here and enjoy the liveliness and beauty of this Italian masterpiece. The unforgettable backdrop for Anita Ekberg's midnight swim in Fellini's La Dolce Vita, the Trevi Fountain remains a must-see for anyone visiting Rome. From the big luxury boutiques with the trendiest brands, to corner markets and vintage shops, Rome offers a myriad of possibilities for all shopaholics. Among the most famous shopping streets, you'll find Via del Corso, Via Condotti, Via Veneto and Via del Babuino. If you're a fan of contemporary art and architecture, you can't miss the MAXXI, the National Museum of 21st Century Art. Each year, new exhibits take place inside the splendid building, designed by Zaha Hadid. The nucleus of permanent works includes work by Alighiero Boetti, Francesco Clemente, William Kentridge, Mario Merz and Gerhard Richter. Plus, there is plenty of room dedicated to architecture and photography.